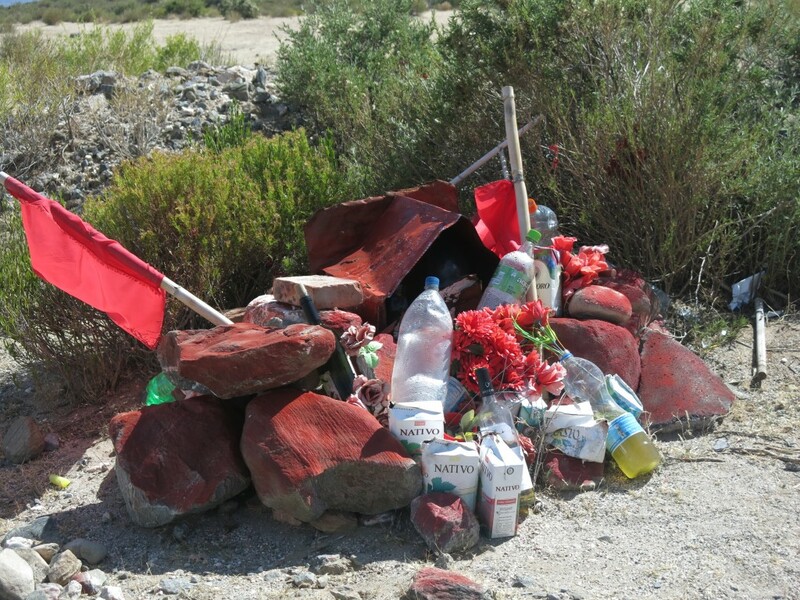 One of the first things that got my attention on the roads of Argentina was the profusion of little shrines surrounded by offerings and decorated with red flags that can be spotted in most provinces I’ve visited. They are usually under trees but not restricted to that (especially where there’s no such thing as trees). There isn’t nearly as many as there are roadside wats in Thailand but there is enough to be noticed. I knew somehow that this was not a Christian thing, there’s always been little shrines dedicated to Virgin Mary of Luján along the roads of Argentina but this felt different. Only after a while my subconscious finally made the link and I realised they were shrines dedicated to the Gauchito Gil. But who is this and why is it everywhere? 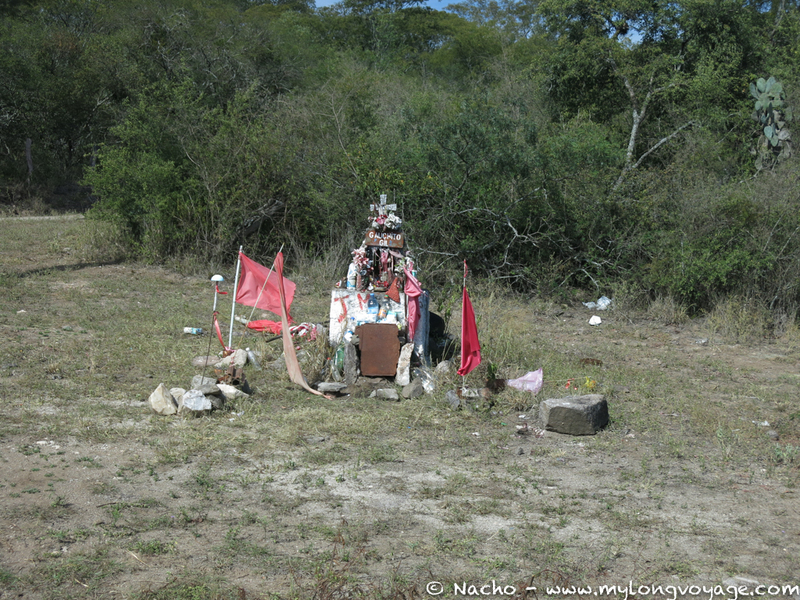 The devotion to Gauchito Gil is a heathen devotion that originates in Northeastern Argentina, in the province of Corrientes, and is apparently propagated by truck drivers. He is said to work miracles. 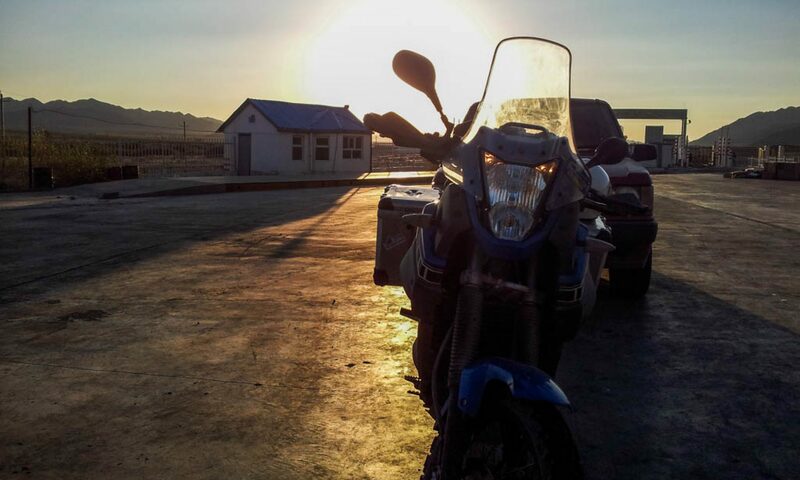 The legend has it that the gaucho Antonio Gil, an adorer of San La Muerte (another pagan devotion), had a romance with a rich widow and that earned him the hatred of her brothers and of a police sheriff that had courted her. Seeing the danger to his life, he enlisted himself to fight in the Paraguayan war. After coming back, he was enlisted by the Autonomist Party of the province of Corrientes to fight in the provincial civil war against the Liberal Party but he defected. Defection being punishable by death, he was hanged from a tree by his foot and his throat slit. Before dying, he told his executioner that he should pray in his name for his son’s health. The executioner’s son healed miraculously and so he decided to give Gil proper burial. The red flags are the symbol of the Autonomist Party. There is other versions of the story and more on San La Muerte in wikipedia in Spanish and in English. Some of the versions even omit the bit about San La Muerte and make him a Christian, thus trying to make him into a Catholic saint. The Catholic Church obviously wants nothing to do with it. It’s one of those things you only notice if you are riding the roads instead of sitting inside a bus.